Vice President Mike Pence said Tuesday that while he wants to see Roe v. Wade overturned, his views didn't influence the president's decision to nominate Judge Brett Kavanaugh to the United States Supreme Court. 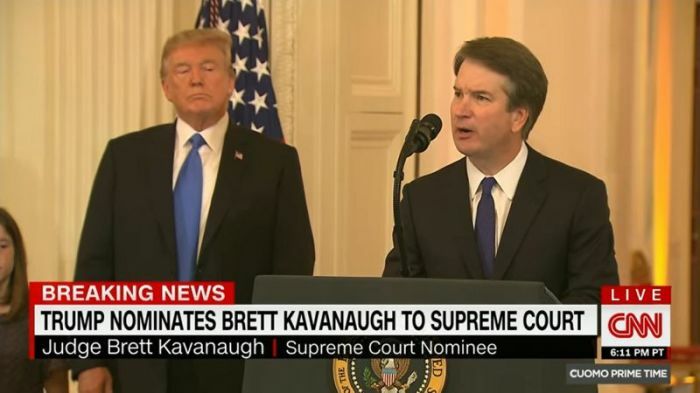 On Monday evening, President Trump announced that he was nominating Kavanaugh to fill the vacancy on the Supreme Court made by the retirement of Justice Anthony Kennedy. In an interview with CNN that aired Tuesday, Pence explained that Kavanaugh was not selected with the goal to overturning Roe v. Wade. "What the president was looking for here was a nominee who will respect the Constitution as written, who will faithfully uphold the Constitution in all of his interpretations of the law," said Pence. "The president believes that the proper consideration for a nominee to the court is not about litmus tests. ... Frankly, we've seen enough of litmus tests over the decades. What we don't want is people to go to the courts with a specific objective or policy criteria." Pence's comments echo what Trump said following his announcement that he had selected Kavanaugh, telling reporters at the White House that "I haven't" asked the nominee about abortion. "I really haven't," added Trump, as quoted by The Hill. "Brett Kavanaugh got great reviews, actually from both sides. It's a beautiful thing to watch." Kavanaugh presently serves on the District of Columbia Circuit Court, having been nominated to the court in 2006 by then President George W. Bush. Many pro-life groups celebrated Kavanaugh's nomination, with Susan B. Anthony List President Marjorie Dannenfelser saying in a statement released Monday that Kavanaugh "is an experienced, principled jurist with a strong record of protecting life and constitutional rights." "President Trump has made another outstanding choice in nominating Judge Brett Kavanaugh to replace Supreme Court Justice Anthony Kennedy, keeping his promise to nominate only originalist judges to the court," Dannenfelser added. In contrast, many pro-abortion rights groups have denounced his nomination, with Planned Parenthood Federation of America stating on Monday that the Senate must vote down Kavanaugh. "There's no way to sugarcoat it: with this nomination, the constitutional right to access safe, legal abortion in this country is on the line," stated PPFA Executive Vice President Dawn Laguens. "Generations of women, especially women of color, will be affected. And generations of people have grown up only knowing a country where they have the right to access safe, legal abortion."